And the winner is … well, more on that in a minute. The big news with the online poll to name the newest environmental ambassador at the Wildlife Center of Virginia in Waynesboro is that the effort was apparently hacked. 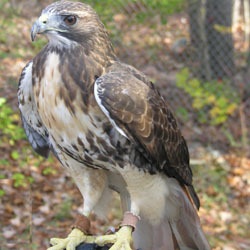 The votes – the legitimate ones, at least – eventually came down in favor of Ruby the Red-Tail. Ruby, a red-tailed hawk hit by a car in Dayton in February 2010, cannot return to the wild due to the severity of her injuries, and will travel with Wildlife Center staff to schools, libraries, and other public events and help share the steps that each of us can take to protect wildlife and the environment. The Center in January asked local elementary schools to suggest a name, and came up with a list of 174 names that were later winnowed down to a final five. The polls opened online on Feb. 2 to pick the winner, but were closed on Feb. 19 after Center staff noticed irregularities, specifically robo-voting that cast more than 5,000 votes for the name Phoenix from a single overseas Internet service provider, including 3,021 in a six-hour period between midnight and 6 a.m. the morning of Feb. 19. The purpose of the Center’s online contest was to seek the public’s views on the suggested names, especially from children, not to test computer hacking skills or the ability to rig an election. It’s unfortunate that someone takes pleasure from hacking into, and attempting to spoil, a contest in which so many schoolchildren and others have enjoyed participating,” Wildlife Center president and co-founder Ed Clark said. Excluding the robo-votes, Ruby led the field with 35.3 percent of the legitimate votes cast, outpacing runner-up Twizzler, which received 25.6 percent. Phoenix came in fourth with 15.3 percent once the robo-votes were discarded. “The Wildlife Center is most grateful for the participation of local students and teachers and the more than 4,000 individuals who voted. And our appreciation is not diminished because a couple of people sought to cheat and spoil the contest,” Clark said.